Cinnamon Swirled Peanut Butter Lazy Dog Biscuits 14 oz. 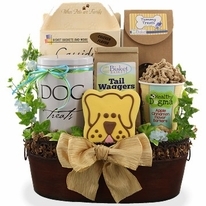 Gift Size 14" X 7" X 15"
The perfect dog gift for your favorite Diva dog! 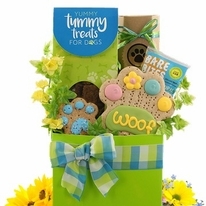 This high end doggy gift is perfect for those pooches who think they are all that and the bag of chips. Yeah you know the dog; when the owner says "heel" she's thinking pink fluffy heels a nice warm fluffy coat! 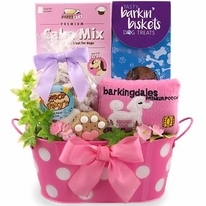 This gift is a bit more Diva as every treat inside is gourmet and the adorable plush Barkingdales Credit Card plush Squeaker toy is so appropriate and fun! 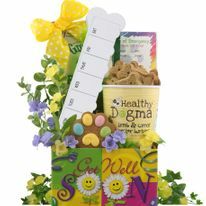 Well spoil her like she thinks she deserves with our Diva Dog gourmet dog gift for her doggie birthday gift, get well dog gift, miss you doggy gift and any reason you can think of.